It started with barroom boasting and has grown into a sport followed by millions on cable TV and in arenas nationwide. Frank Caliguri of Arnold, Pa.—a black belt in karate and owner of the Academy of Martial Arts—was motivated by the ribbing he got while promoting karate, and so he decided to stage a “Battle of the Tough Guys” competition with fellow black belt Bill Viola. 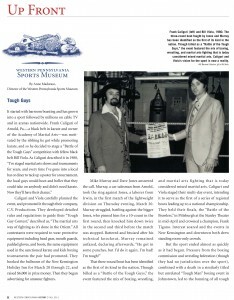 As Caliguri described it in 1980, “I’ve staged martial arts shows and tournaments for years, and every time I’ve gone into a local bar or diner to tack up a poster for a tournament, the local guys would hoot and holler that they could take on anybody and didn’t need karate. Now they’ll have their chance.” Caliguri and Viola carefully planned the event, and promoted it through their company, C.V. Productions. 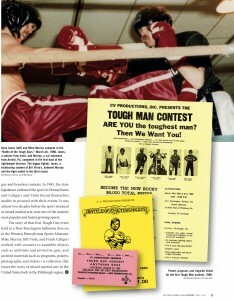 They developed detailed rules and regulations to guide their “Tough Guy Contest,” described as, “The martial arts way of fighting as it’s done in the Orient.” All contestants were required to wear protective equipment including head gear, mouth guards, padded gloves, and boots, the same equipment used in the sanctioned karate and kick boxing tournaments the pair had promoted. They booked the ballroom of the New Kensington Holiday Inn for March 20 through 22, and raised $6,000 in prize money. Then they began advertising for amateur fighters. Mike Murray and Dave Jones answered the call. Murray, a car salesman from Arnold, took the ring against Jones, a laborer from Irwin, in the first match of the lightweight division on Thursday evening, March 20. Murray struggled, battling against the bigger Jones, who pinned him for a 10-count in the first round, then knocked him down twice in the second and third before the match was stopped. Battered and bruised after his technical knockout, Murray remained unfazed, declaring afterwards, “He got in some punches, but I’d do it again. I’m bad! I’m tough!” That three-round bout has been identified as the first of its kind in the nation. 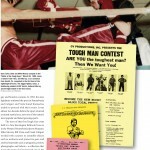 Though billed as a “Battle of the Tough Guys,” the event featured the mix of boxing, wrestling,and martial arts fighting that is today considered mixed martial arts. Caliguri and Viola staged their multi-day event, intending it to serve as the first of a series of regional bouts leading up to a national championship. They held their finals, the “Battle of the Brawlers,” in Pittsburgh at the Stanley Theater in mid-April and crowned a champion, Frank Tigano. Interest soared and the events in New Kensington and downtown both drew standing room-only crowds. But the sport ended almost as quickly as it had begun. Pressure from the boxing commission and wrestling federation (though they had no jurisdiction over the sport), combined with a death in a similarly titled but unrelated “Tough Man” boxing event in Johnstown, led to the banning of all tough guy and brawlers contests. In 1983, the state legislature outlawed the sport in Pennsylvania and Caliguri and Viola found themselves unable to proceed with their events. It was almost two decades before the sport returned as mixed martial arts, now one of the nation’s most popular and fastest growing sports. The story of that first Tough Guy event held in a New Kensington ballroom lives on in the Western Pennsylvania Sports Museum. 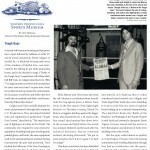 Mike Murray, Bill Viola, and Frank Caliguri worked with curators to assemble objects such as uniforms and protective gear, and archival materials such as programs, posters, photographs, and tickets—a collection that traces the roots of mixed martial arts in the United States back to the Pittsburgh region. CV (Caliguri and Viola) Productions was the first mixed martial arts promotional company in American history, established in 1979. CV Co-founder, Bill Viola, wrote the first codified set of mixed martial arts rules in 1979; implemented in over 130 bouts. Those standards parallel the unified rules of today. 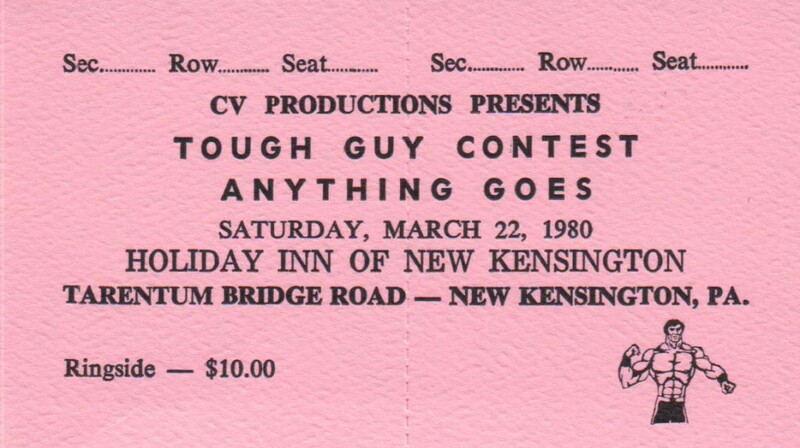 CV Productions introduced open regulated mixed martial arts competitions to the United States March 20, 1980 in Pittsburgh, PA with the inaugural “Battle of the Tough Guys” championship aka Tough Guy Contest. 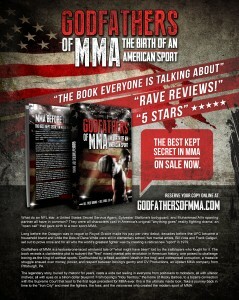 This was the first commercial MMA success and the beginning of a new sport. The Tough Guy Law: Pennsylvania became the first state in history to set a legal precedent for mixed martial arts, officially banning the sport of MMA with the passage of Senate Bill 632 (Session of 1983 Act 1983-62). Mixed martial arts was outlawed due to the Tough Guy (MMA) vs Toughman (boxing) controversy.